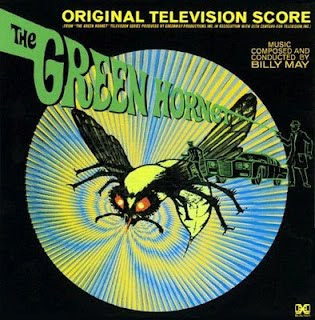 This is a 1993 re-release of Billy May's 1966 soundtrack to the television show The Green Hornet and includes 7 additional tracks not on the original release. Some of the bonus material raises eyebrows, I'm not sure if the Batman theme or "Adagio In G Minor" have much relevance to The Green Hornet and their inclusion here seems more like a marketing ploy than anything else. The music itself is generally a mix of big band, jazz and some lounge elements with the main exception being the aforementioned "Adagio In G Minor" which is a profound piece of classical music that certainly adds weight to the whole collection ( it should be familiar to most people due to it's use in countless films and television programs ). Fans of the Ultra Lounge series should find plenty of enjoyment with tracks like "Kato", "Four Hornets" and "Black Beauty" all displaying a groovy charm. It's a bit full on at times but I guess you have to expect that with this kind of soundtrack. However, the fact that there has been a number of reissues gives an indication of the underlying quality inherent in these compositions. If you're expecting the great music from the action sequences of the show, you'll probably be disappointed; there isn't much of that here.. BUT, it is Billy May, so that's good. This is super fabulous, greatly enjoying the album, what a great find! Thanks for posting, this is one of my favorites of the past several months! Is a re-up possible please? Thanks a lot in advance.And thanks a lot for this amazing blog! RAPIDSHARE - THE NEXT ONE TO GO?